Since acquiring him from Tampa Bay at the trade deadline, Wilson Ramos has been the Phillies' most productive hitter. Before the Phillies begin courting the likes of Bryce Harper and Manny Machado this offseason, they will first make a few decisions on players of their own. 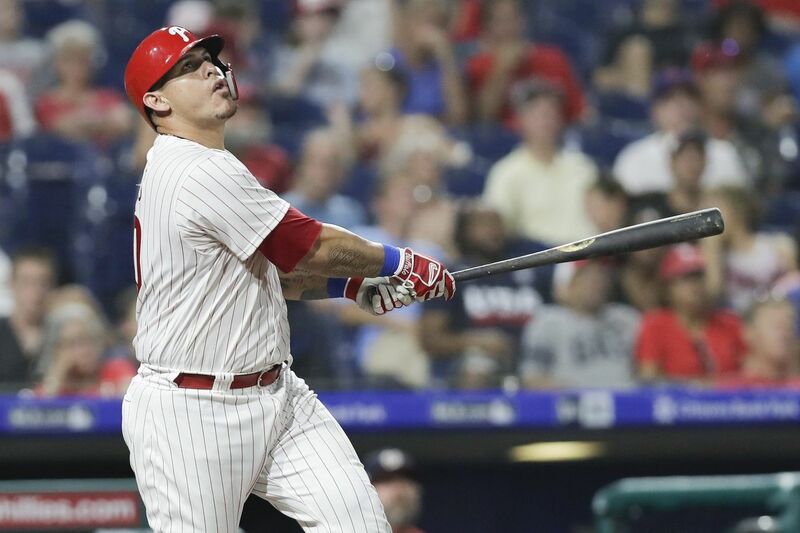 One of those calls will be whether the Phillies want to bring back Wilson Ramos, who has been the team's most productive hitter since being acquired at the trade deadline but has been noticeably slowed by two tender hamstrings. A short-term deal — maybe even a one-year contract — would be beneficial to the Phillies as they could pair Ramos in 2019 with Jorge Alfaro. "I don't think there's anybody in baseball that wouldn't like to have one of the better offensive catchers in the game," manager Gabe Kapler said. "My job is obviously to manage the men we have in our clubhouse right now. And I think when we get to the offseason, there's some time for that. That's something I trust 100 percent in our front office to sit down and analyze." Ramos' hamstrings have been a concern this season, but there is hope that an offseason would be enough time for him to heal. The Phillies would be signing a catcher much healthier than the one they used for the second half of this season. Plus, Kapler will be able to spell Ramos and keep him right by using Alfaro more often than other managers use their backup catchers. Bringing back Ramos, who entered Monday with a 1.024 OPS in 74 plate appearances with the Phillies, seems to be an easy decision. Jerad Eickhoff pitched in a simulated game on Saturday and it would not be a surprise if the right-hander made a start sometime in the final two weeks of the season. Eickhoff has been sidelined all season, working his way back from a spring-training injury and then a nerve issue in his fingertips. Ending the year with a start would be a nice reward. "I asked him, 'Did you take that three innings of work and was it like you were making a start?' You could see it out on the mound in his intensity and the answer to that question is, 'Yes.' But he confirmed that," Kapler said. "If you asked him how he thought he performed, he thought he performed well. I thought he performed well. There's a lot of promise. I'm not going to make any declarations about his role going forward. I don't even think it's appropriate to do so." Roman Quinn was left out of Monday's lineup as his fractured toe remains sore. … Reliever Aaron Loup will likely be activated from the disabled list Tuesday. … Maikel Franco remains sidelined with a sore shoulder. … Aaron Nola will start Tuesday against lefthander Steven Matz.